Panasonic company recently launched his latest Eluga series handset with the name of Panasonic Eluga I4. Panasonic Eluga I4 smartphone comes with dual micro SIM (GSM and GSM). The Panasonic Eluga I4 is powered by a MediaTek Quad-core processor which is running on Android Nougat and priced at Rs 8,290 only. This handset comes with 3000 mAh non removable Li-Ion battery. 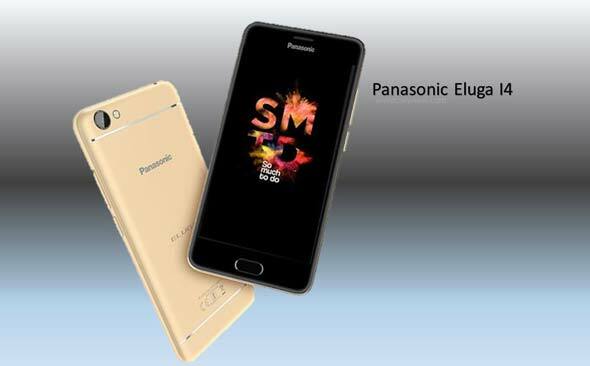 Panasonic Eluga I4 dual SIM Smartphone comes with 5-inch touchscreen display which comes with 720×1280 pixels resolution.This Smartphone is powered by 1.25GHz Quad-core MediaTek MT6737 Cortex-A53 processor with 2GB RAM and 16GB internal storage capacity which will be expandable up to 128GB via micro SD card. The Panasonic Eluga series I4 Smartphone is running on the Android 7.0 Nougat operating system. This is a dual SIM Smartphone which has two Micro SIM slots. This Smartphone comes with 8MP rear camera with LED Flash and Auto Focus with Geo-tagging feature. It also comes with 5MP front facing camera for taking selfies and video calling facilities. The Panasonic Eluga series I4 Smartphone comes with 3000mAh non removable battery along with different connectivity features. This Smartphone comes with Wi-Fi 802.11 b/g/n, Wi-Fi Direct, Hotspot, Bluetooth v4.0, GPS, FM Radio, 3.5mm Headphone, Micro USB v2.0. This smartphone comes with Fingerprint, Accelerometer, Proximity sensor features also. The Panasonic Eluga series I4 smartphone weight is 150.7 grams which comes with 146.7×71.3×8.33 mm dimension. This smartphone available in – Black, Blue and Gold colors and priced at Rs. 8,300 only. The main important key features of Panasonic Eluga I4 smartphone comes with 4G, VoLTE, GPS, Bluetooth and Wi-Fi features. This is a dual SIM smartphone which is running on Android Nougat operating system. This smartphone comes with fingerprint sensor along with OTG support. It has MediaTek MT6737M chipset with 1.25 GHz 64-bit Quad-core processor with 2GB RAM.